Full suspension bikes are a favourite among older and more experienced bikers, but that doesn’t mean they aren’t for beginners too. With both rear and front shocks, a full suspension bike promises to provide a much cushier ride than a standard hardtail, or a front-suspension-only bike. If you plan on doing any downhill racing or dirt hill jumping, then the full suspension is practically a necessity, but the dual suspension action proves useful on cross-country and enduro rides as well. If you’re feeling overwhelmed by all of the choices in full suspension bikes or simply want to know which are the best, we’ve done the legwork. Browse our buying guide and check out this comprehensive list of the best full suspension mountain bikes. It’s rare when our pick for best overall bike is also a budget bike, and yet, we couldn’t resist. The Diamondback Recoil is that good. 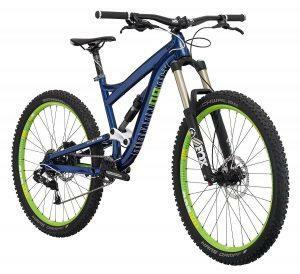 The ratio of quality to price on this model is outstanding, making it the perfect pick for most mountain bikers, from beginners to avid riders. Perhaps the best feature on the Recoil is its balanced, neutral geometry, making it perfectly suited for both uphill climbs and downhill sprints. Aside from the bike’s excellent geometry, the Recoil also comes with a comfortable four inches of travel, allowing for mid-range jumps and some low-intensity downhill riding. Like a lot of Diamondback models, the Recoil is situated on a set of 27.5-inch tires, great for agility and terrain coverage. Overall, we couldn’t recommend a more solid choice for average-level mountain riders looking for a cost-effective, but comfortable ride. This stellar model is designed for mountain bikers who want it all–uphill, downhill, cross country, enduro, freeride or more. You name it, this bike can do it. The Diamondback Mission 1 bike can cover any terrain you want, and do it well. With six inches of travel, this bike offers serious shock protection, allowing you to take on some serious jumps without wrecking your joints in the process. The Mission 1 also feature a balanced 27.5-inch set of wheels, offering the best of both worlds for riders who want both speed and obstacle coverage from their bike. Suspension in both the front and rear of the bike is adjustable, allowing you to pick your travel needs based on the trail you’re riding at that moment. This is a highly advantageous feature for serious bikers who want to do a variety of rides. 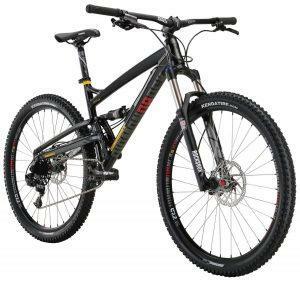 We recommend this bike for everyone who loves mountain biking and who want a full suspension bike that can do everything. Yes, it’s another Diamondback model, and with good reason. 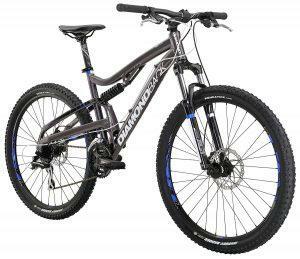 Diamondback is a trusted brand that knows what they’re doing when it comes to full suspension bikes. The Diamondback Atroz Comp is a streamlined bike that does away with the high-end features that a lot of riders may find unnecessary, and focuses on making a simpler high-quality ride. Built around a durable aluminium frame, the Atroz Comp features the mid-level 27.5 inch wheels and provides you with a cushiony 4 inches of travel. Top that off with a set of hydraulic brakes and an SRAM NX 1x11-speed drivetrain, and you have one very effective mountain bike. Finding a budget suspension bike that meets our stringent standards is no easy task considering high-quality full suspension bikes are generally above the $800 mark (good ones anyway). The Gravity Suspension Mountain Bike with Shimano shifting is an exception. This budget ride is incredibly solid, featuring a 24-speed gearing system, durable yet lightweight aluminium frame and both front and rear Tektro Novela disc brakes. It’s no wonder this full suspension is a best seller. Perfect for entry-level to mid-range riders on a tight budget. We’ve put together a range of options, but how will you know which bike is right for you? While we typically recommend adhering to a budget, with full suspension bikes, we recommend putting your needs as a rider before the constraints of your budget. Why? Simply put, full suspension bikes are more complicated than hardtail (rear suspension only) and rigid (no suspension at all) machines. More shocks mean more moving parts and more potential for something to go wrong if you don’t have all aspects of your bike working in harmony. Every bike on our list is high quality, however, mountain bikes are not one-size-fits-all machines–quite far from it. You need to consider how your riding style and discipline will mesh with your bike as a whole, not just the suspension system. That said, you could spend hours obsessing over every detail of your bike, and while that’s not a terrible idea, it’s time-consuming. In an effort to save you time on your search for the perfect machine, we’ve narrowed down two key features that full suspension riders should consider when making their final decision. You might be wondering what travel is considering it’s a relatively technical term, so allow us to explain. Travel is the amount of space your bike’s suspension system will compress. Another way of thinking about travel is the quantifiable amount of shock your bike can absorb. 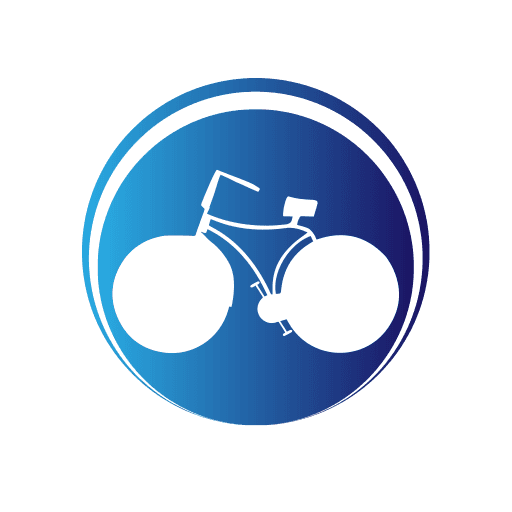 It stands to reason that bikes with large travel, or a higher amount, will be better for rough riding with a lot of downhill slopes because they are able to digest a lot of the turbulence caused by the increased impact. Conversely, bikes with short travel are better for easier, flatter landscapes that require nothing more than small bunny hops. Travel is typically measured in inches and can range from 1 inch to 10 inches. To better understand where you fall on that scale, we’ve made a cheat sheet linking the amount of travel to the type and intensity of riding best suited for that amount. Take a look and see where you fit best. One to three inches of travel is best suited for very easy rides, usually on a paved surface with little to no obstacles. If you’re buying a full suspension mountain bike, chances are you will definitely want more than two inches of travel. You would be hard-pressed to find a full suspension bike that falls within this range of travel. Three and four inches of travel is best suited for cross country trails with low to mid-range intensity. Stick with three or four inches if you plan on riding all-around trails with little off-roading and downhill components. While you can get away with three inches of travel on a full suspension bike, we recommend at four inches if you plan on doing anything above a low-intensity trail. Five and six inches of travel is the sweet spot for most riders, particularly those interested in full suspension bikes. Dual suspension is already aimed at bikers looking for epic adventures, and if that’s you, you want to ensure the travel of your bike matches your intrepid ambitions. 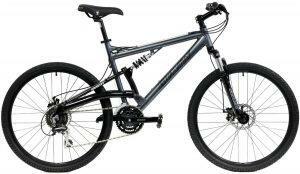 You will find most ‘All Mountain’ bikes–or those geared toward off-roading and enduro rides–will have five or six inches of travel. Seven and eight inches of travel are best for those looking to ‘Freeride’, or stick mostly to downhill rides with a lot of hard jumps. This amount of travel also works well for ‘All Mountain’ riders who want a little extra support and don’t mind shelling out some extra cash to get it. It goes without saying that bikes with nine and ten inches of travel are for intense, downhill riders. If you plan on doing a serious amount of downhill riding in which you are usually driven to the top of a trail and race full-speed to the bottom, dodging obstacles along the way, then you need to have none or ten inches of travel. Otherwise, you’re safe sticking to the lower end of the spectrum. Wheels and tires are incredibly important in shaping the ride and feel of your bike, and are a key feature to consider. Wheels typically come in three sizes: 26 inches, 27.5 inches or 29 inches. Small, 26-inch wheels offer you manemanoeuvrability agility on the trail, but will generally have a harder time getting over large obstacles, so they aren’t ideal for intense off-road riders. Large, 29-inch wheels are ideal for barrelling over any bump and landing any jump, but are harder to accelerate than their small, 26-inch counterparts making a tad slower overall. The mid-range 27.5-inch wheels offer the best of both worlds and are a great choice for cross country trail riders who want a mix of speed and terrain coverage. Once you’ve picked out a size, you’ll need to think about the type of tire on your wheel. Tires differ in traction, handling, and durability based on their tread pattern, material, size and design. If you’re planning on doing much cross country trail riding on your full suspension bike, then you’ll likely want a mountain bike with sport tires and heavy traction. The deeper the tire tread, the better traction you’ll have on those slippery, muddy, mossy surfaces. Most tires come standard with insular tubes, but more and more bikes are implementing tubeless tires which can provide better handling on tight turns, more longevity in tire pressure and a smoother ride. Choosing a new new mountain bike isn’t easy, especially a full suspension model which can be infinitely more complicated. But with a little consideration and help (you’re welcome! ), you can find the model that’s best for you. To see our list of the best overall mountain bikes of any kind, read this article. Helpful as I was just searching for a replacement suspension for my MTB!